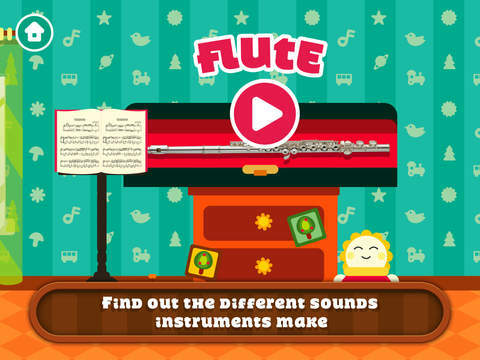 Start your child's journey into the wonderful world of music in a fun and engaging way. “Tap The Melody is an excellent learning tool for babies and toddlers" - The top app for child rhythm development. Your child will discover the sound of different instruments while being able to create his own masterpiece by changing the tempo and rhythm of the music. To start, just pick a musical instrument, the background track and begin to play. Pressing a key will make the notes come to life in the form of a melody. - Eight tunes by world-renowned composers. 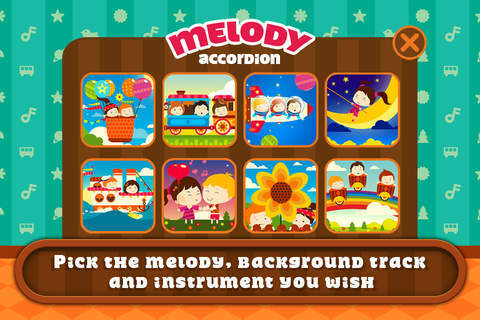 - Four musical instruments: piano, guitar, flute and accordion. - The ability to experiment with rhythm and sound. - Eye-captivating animations for each melody. - No built-in advertisements in order to keep your child's creativity flowing. With "Tap The Melody" your child will feel like a real musician by being able to switch out the melodies, background music or instrument at any time. This application was developed with kids in mind, the melodies were carefully selected to encourage your child's development and allow him to unfold his creative side. If you want your child to become interested in the world of music and musical instruments, download "Tap The Melody" Today! Just installed this on my ipad which has been updated to version 7.1, and the app opens with NO sound. Not rating it yet because I'm hoping they fix this and my money is not wasted. Cool concept though. No sound!!! Has great potential IF IT HAD SOUND.